It was the final day of the first test match between India and Australia played for the Gavaskar-Border trophy. The year was 2010 and the venue was Mohali. If you are a cricket fan, you know by now which match I am talking about. If you are an even greater Indian cricket fan, you would have guessed it by the title itself. Ricky Ponting had marshalled his troops well to secure his first ever test win on Indian soil. MSD had been equally fantastico and had given the Kangaroos a run for their money. Sachin Tendulkar had yet again missed a century, getting out on 98 and so many people thought India would win. But things looked grim and rather shoddy on day 5. On that day, to my utter bad luck and disappointment, I was sitting in my college classroom, impatiently waiting for things to get over. My mind went to a supposed parallel world where I was sitting at home, with some puffs, watching the big game.Where I could go from there was sadly to my Physics lab only. But as it turned out, that was enough. In the lab, our teacher, a jovial personality if there ever was one in the teaching species, chose a quick experiment for us. I was going about to get the necessary apparatus from the lab-assistant as I noticed a friend of mine sitting with the funky kids, all of them staring under the table. It took me no minute to realize they were navigating through live match updates on their cellphones. It was, of course, prohibited to bring cellphones to school and the punishment was pretty harsh along with seizure. But they could care less. On that day, even if the authorities had imposed a thousand rupee fine on us, the classmates would have divided that among them and paid it. I quickly went to their table asking them the status. It was rather bad for India as they looked floundering under pressure. Sachin had just gotten out and India went on to lose three crucial wickets within a matter of 5 more runs. The score was now 124/8 and India still needed 92 runs to win with a feeble tail. But there was one man still standing- V.V.S Laxman. This man was the hero of the greatest test match ever played and we hoped for a similar display from him. Curse me as you may, but believe it or not, I still went on to get the apparatus and performed the experiment within a matter of minutes, recording the observations. After getting an “OK” and “go ahead” sort of approval from my teacher, I returned to the seat as another guy got up to perform the experiment. The first thing my friend told me on reaching there was that Laxman was watching the ball as if it were a a football and slashing boundaries regularly. I grabbed his phone, a cool replica of Blackberry phones ( You wouldn’t believe it but there was a time when not everyone had smartphones, let alone school kids) and read the update on it. The score was 16o something for 8 and we were hooked. The other end was held by Ishant Sharma and you could even call him the main guy out there. He seemed to be facing most of the deliveries and the updaters couldn’t help praise him enough. As for us, all we prayed was to keep his wicket intact and let Laxman do the hitting. 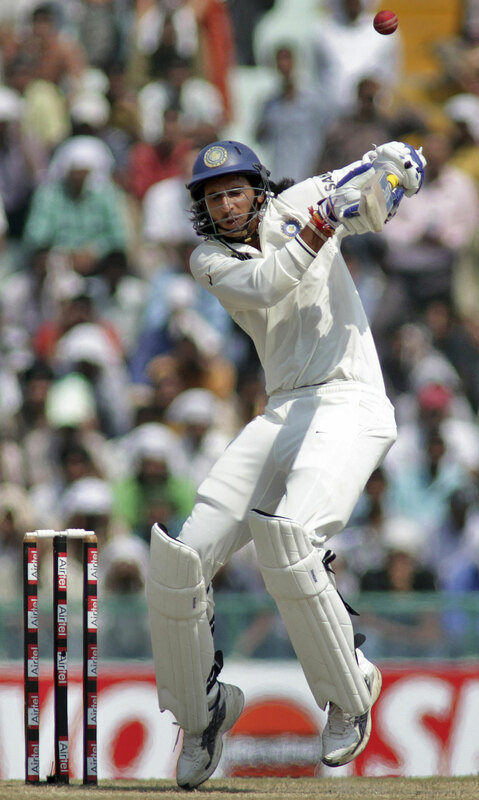 But by the time he had got set, he too started on with the boundaries and looked in prime, sublime form. With every ball, the tension was mounting and the duo on field seemed to be making easy work of it. The runs seemed to be flowing, going by test-match standards and just as everyone on the table had finished his/her experiment, we were par 200. And then struck calamity. My friends lost its data connection with the ‘E ‘ symbol on top of it marked by a cross. He tried reconnecting but to no avail. We seemed to be loosing out cool as he turned off the opening tone on it and switched it off. We prayed for it to connect once he switched it on again and voila, the connection was back. With his fingers fumbling in excitement, he opened the website and just as the page loaded, we all fell on his shoulders to see the status for ourselves. But it was a disaster. Ishant had just gotten out with the team still needing 11 runs to win for 1 single wicket. We read that Ishant’s lbw decision was an error on the part of the umpire as some of the guys began to curse him. We also read that Pragyan Ojha had come in at number 11. All our hopes now rested with Laxman and Laxman only. And the guy lived upto them, letting Ojha play few deliveries, taking singles on the last bowl to keep strike. We made five tough runs like that with Laxman getting in a tussle with Ojha, as an update told us. We prayed for the players to keep their cool. Then came the final over but Ojha was on strike this time. Ricky Ponting got his pace machine Johnson to bowl that over. And the second delivery, he bowled something that made the updater write “That was Out” as our hearts came to our mouths. But then he wrote that the umpire gave it not-out and much to our jubilation, the lbw call had resulted in an overthrow for 4 runs! India just needed two runs now. The next delivery, Ojha let go calmly. We were snappy as Johnson bowled the fourth ball of the over. And there it was. 2 leg byes as India won the heart-stopper. There was pandemonium in and out of the cellphone world as we erupted in ecstasy.